NOTE TO THE READER: this article deals with metalloid silicon, a chemical element with the symbol Si and atomic number 14; not to be mistaken with silicone, a range of polymers that combine the chemical element silicon with carbon, hydrogen and oxygen. The release of the news that Britain’s economy shrank a further 0.5% in the second quarter of 2012 has come as no surprise to many. In a world of such financial uncertainty, few industries are able to prosper, much less guarantee long-term success. There is, however, one area of trade that is so assured of its continued growth, the possibility of failure applies not to its companies, but exists only in the fretting minds of those who create and service the products of the watchmaking industry. When it comes to haute horology, failure is not an option. Everything from the appearance of the watch dial to the tiniest integral part of the movement must be perfect. The industry is one of the most rock-solid in the world, thanks in large part to its target market: the super-rich, who have, in practical terms, remained more or less untouched in by the recession. It is then somewhat ironic that the products that constitute the foundations of this formidable fiscal fortress can be stopped in their tracks by a single speck of dust. The only real problem faced by the watch industry is the same problem it has faced since the first masters began to take time seriously: the truly timeless problem of friction. In the early days of horology, the problem was deemed almost unsolvable due to the absence of a suitable lubricant. One pioneer in particular, a man named Abraham-Louis Breguet, dedicated his life to the design of new escapements – the part of a watch responsible for the release of the stored power of the watch’s mainspring – in an attempt to create a system that ran smoothly and could improve not only the timekeeping of the watch, but also the longevity of the components. For years his designs were regarded with academic interest and his craftsmanship admired for its intricacy, but the absence of a material capable of fully exploiting his revolutionary forethoughts consigned his work to the category of curiosity. One of the major challenges faced by Breguet and his competitors was the poor quality of steel in the late eighteenth and early nineteenth centuries. It was coarse, brittle, pitted easily and was generally awkward to work with. But in one important regard it was superior to modern steel: it was hardier. Modern steel is far easier to work but enjoys a much bleaker life expectancy than its rugged forerunner. However, when coupled with modern synthetic oils a compromise, now long accepted in watchmaking, is found. The limitations of modern steel’s integrity are tolerated because of advancements elsewhere in the movement that are only able to exist because of the fineness of the steel used. But essentially, the watch would not last as long as it theoretically could, were the beneficial properties of ‘old’ and ‘new’ steel merged – an impossible feat. That was, that is, until the emergence of silicon. The implementation of a totally new material has received a mixed reception. The perennial tug-of-war in the industry between progress and tradition has, perhaps not since the appearance of the early quartz watches, been so keenly felt. Purists baulk at the idea of using processes and technologies that they regard as almost insulting towards the talents of the pantheon of skilled craftsmen that constitute the trade’s venerable history. The idea of using super-substances, created by white-coated scientists in labs, not grubby-handed men hunched over a desk with a file in their hand is almost unsavoury. For an industry whose history includes tales of men overcoming the greatest odds and succeeding in constructing mechanical instruments so accurate, so revolutionary, that they allowed their users to circumnavigate the globe in an age before any form of long distance communication and even, in some cases, reliable maps, the notion that a man who has never seen the inner workings of a watch, nor cares for the artisanship of the trade might, in fact, make a contribution to the advancement of accuracy and longevity that could arguably rival that of Breguet is, for some, sickening. But watchmakers are nothing if not perfectionists, and if a material emerges that could give them a shot at the impossible – constructing the ‘perfect watch’ – those worth their salt would be first in line to get their hands on it. Several esteemed watch houses have begun experimenting with silicon as a likely successor to steel. In particular, the research conducted by Swiss Watch manufacturer Ulysse Nardin, founded in 1846, has highlighted many advantages of the material, as well uncovering a method of manipulation enabling micromechanical parts to be cut and treated in a way that makes them suitable for integration into existing movements. And the results have been spectacular. Back in 2006, Ulysse Nardin and Sigatec embarked on a joint venture dubbed Diamaze Micro-Technologies and began experimenting with silicon. They pioneered a process known as Chemical Vapour Deposition (CVD) similar to Powder Vapour Deposition (PVD) commonly used to coat watch cases and other industrial pieces to increase their durability. By conceiving a method enabling diamond to be chemically deposited on the surface of the silicon components, they managed to produce a synergised material that boasts a hardness ten times that of steel and titanium (even in an uncoated state, the hardness of silicon comes in at 1100 Vickers as opposed to 700 for steel). The result is a substance perfect for watchmaking. Not only are signs of wear very nearly non-existent, silicon is, due to its tribological characteristics, self-lubricating. Additionally, it has a few other attractive properties that make it perfect for use in watches: it is resistant to magnetic fields, shock-absorbent, cheaper to produce than traditional materials (thanks in large part to the potential of the DRIE process, which uses light to effectively create a solid ‘photograph’ of the piece, in much the same way a pinhole camera would ‘etch’ an image using sunlight), far lighter than its rivals, less likely to deform in extreme temperatures or under duress and can be moulded, allowing the combination of multiple components, which not only saves space but also allows for greater tolerances when creating the parts. While it is becoming more widely accepted that silicon is a viable replacement for steel in the manufacture of some wheels, a handful of companies have attempted the creation of a silicon hairspring – the heartbeat of mechanical watches. The regular oscillations of the spring, coiled above and attached to the balance wheel via the balance staff, dictate the release of the power stored in the barrel, which contains a spring under constant pressure accumulated in the winding process, by releasing the escape wheel at set intervals. 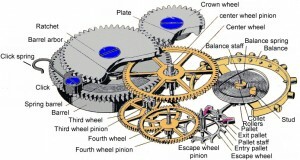 The ‘going train’ (the series of geared wheels that run through the watch) is under constant stress from the reserve power of the mainspring, and thus the escapement, which includes the balance wheel and staff, hairspring, pallet and escape wheel, charged with holding back the drive from the barrel, needs to be incredibly strong as well as light if the spring is to oscillate at a rapid enough rate and with enough regularity to achieve sufficient isochronism (consistent timekeeping in all positions). As well as being exactly the sort of avant-garde gimmick that sells watches, silicon’s resistance to temperature, near-flawless creation process and molecular elasticity make supreme accuracy a possibility. Will silicon overtake steel in watchmaking? It would seem probable that, as time passes, it will gain further acceptance due to its undeniably cost-effective production and the perceived reduction in servicing needs, but it is early days and its greatest challenge may not be storming the bastion of centuries-old tradition, but perhaps some unseen flaw that will only rear its head after further testing. But right now, it looks as if Breguet’s wish for the perfect oil may have been answered in a way that would, in his day, have been thought impossible. And thanks to silicon, we should be able to tell exactly how long the journey takes.